Hogue, a company best known for their gun grips and rifle stocks, has recently entered the realm of high end production knives. This is a pretty bold move for any company. After all, to quote Borormir in the the Lord of the Rings, “one does not simply start manufacturing knives” …or something like that. So Hogue teamed up with one of the best in the business – award winning knifemaker Allen Elishewitz. Quite frankly, the results of this collaboration are extremely impressive. This is a very nice knife by anyone’s standards, and it’s hard to believe Hogue has never made a blade before. I had to acquire one of their knives for review. So lets take a closer look at the EX01, the knife that put them on the map. The EX01 comes in two different sizes (3.5″ and 4″ blades), with two different blade shapes (drop point and tanto), and two different handle materials (G10 or aluminum). Shown here is the 3.5″ model drop point with a G10 handle. This particular knife has an overall length of 8″, and 3.5″ blade and it weighs 4.3 ounces. Its aluminum counterpart weighs slightly more at 4.6 ounces, but tends to retail for slightly less. All of the EX01 folders are made in the USA. The 4″ version of the knife has an overall length of 8.875″ and weighs 5.1 ounces (5.6 for the aluminum version). I selected the 3.5″ model because I wanted to use the knife for every day carry, and I am very happy with that decision. The knife carries well, feels light for its size, and the drop point version is reasonably unassuming. The 4″ version strikes me as a bit much for EDC, but that is a choice that ultimately you will have to make. The drop point version of the knife is nicely executed. You have a high flat grind with a long lean swedge that falls into a sturdy tip with an edge that has a good amount of belly. Speaking of the edge, the EX01 comes with the nicest edge I have ever seen on a production blade. It is a full mirror polished edge – perfectly formed, nice and even. Apparently these are all done by hand. With most production level knives the edge grinds are usually a little off, and some can be downright sloppy. Needless to say that wasn’t the case with this knife. And yes, the knife came extremely sharp. I guess the only problem is while I can sharpen a knife ok, I will not be able to maintain that mirrored edge with my usual stones. My advice is to instead try and maintain the edge with a strop while you can. The tanto version of the knife is quite striking, featuring a wicked raised spine, and downward sloping blade. I would not mind adding a tanto EX01 to the collection at some point either! Hogue went with tried and true 154CM for the blade steel. This particular 154CM has been cryogenically heat treated to 57-59 HRc. It takes a nice edge, and has held onto it after a good amount of use. I’m not saying it’s a super steel, but I have always been a fan of 154CM. Here my thoughts are no different. Not only does it polish up beautifully, it also stonewashes very nicely – as evidenced by the handsome tumbled finish on the EX01. The EX01 is offered with either an aluminum or G10 handle. Hogue calls their G10 (shown here) “G-mascus.” Really it’s just layered G10 with some waves in it, finished to bring out a faux damascus look. Personally, I prefer the less busy look of regular G10, and probably should have gone with the aluminum version of the knife. That said, the G-mascus is a little different, and I’m some sure will like the effect. More importantly the handle is superbly constructed. It’s made from 2 pieces of G10, and has been bolted together along with partial stainless steel liners. I love the hardware Hogue selected for the button lock, pivot, and safety. The bright stainless steel contrasts nicely with the handles, and the whole production just oozes of quality. The design features a lanyard pin, which is an elegant alternative to your more common lanyard hole. All in all construction is very solid, and the knife is beautifully finished. In hand the EX01 is a solid performer – comfortable and capable. Allen apparently has a strong martial arts background, and I can see this in his “ergonomic plan.” The position of the finger choil sets you back on the knife a bit to maximize reach. In this position the EX01 feels very comfortable, with your palm melting into the rounded pommel, and your finger sliding confidently around the choil. There is some jimping along the back of the knife. It’s not super aggressive, but provides some grip and feedback. You can choke up on the handle, and that works well too. The knife feels very good in a reverse grip as well. The pocket clip is an interesting and almost feminine contrast to the rest of the knife (especially the sharp lines of the tanto version). Rounded and bulbous, this spoon-style clip is securely held in place with 3 screws, and is tapped for right side tip up / tip down carry. Despite the contrast this is a nice pocket clip – secure and easy to use. It rides reasonably low, and is easy to insert and remove from the pocket. I really like how the EX01 carries (at least the 3.5″ version). The knife is light and comfortable, and I quickly forget it is on me. I think it’s a great choice for EDC. The EX01 makes use of ambidextrous thumbstuds to open the blade. The thumbstuds are nicely positioned, and it is very easy to pop the blade out with your thumb. Deployment is both fast and smooth thanks to a unique design where large stainless steel washers are molded into the partial liners of the G10 handle. According to Allen these integral washers will burnish over time, and the knife will get smoother and smoother. The aluminum version does not have any liners. Instead, a raised portion of the type 3 hard anodized finish mates directly with the tang of the blade. Type 3 hard anodizing is extremely tough, and like the stainless steel washers it will burnish over time. Either way, deployment will be smooth, fast, reliable, and durable straight out of the box. The EX01 makes use of a button lock to secure the blade open. The button lock has been nicely implemented. Lockup is very sturdy, and firm (but reasonable) pressure is required to disengage it. In practice the lock feels strong, and it has worked well for EDC tasks. I would put it right up there with an axis lock or compression lock for regular use. There is an added external safety that can be used to lock the knife open. Personally, I’m not a huge fan of external safeties, and I find that this one has got in the way on more than one occasion. It can be removed, but the handle doesn’t look as good without it. Blade retention (or the “detent”) is pretty good on this knife. I had no issues with the knife opening accidentally in pocket, but if I wanted I could snap the knife open with a firm flick of the wrist. The EX01 strikes me as a big win for Hogue. I find it especially incredible considering that this is their first attempt at making a production knife. The EX01 is a solid design, with a lot of interesting details. Stuff like matching circular hardware and thumb studs, the lanyard pin, the way the 2 piece handle perfectly fits together, the integral washers, the perfect blade centering, and of course the mirror polished edge all add up to something special and unique. There is an enormous amount of attention to detail, and Allen Elishewitz has provided a thoughtful design to lay the foundation. The only minor issues I could come up with is that I think the “G-mascus” is kind of hokey, and I could live without the external safety. Some might find the pocket clip too large or funky, but it wasn’t an issue for me. If that is the worst I have to say about the EX01 it leads me to believe Hogue did a damn fine job. And when you consider how this knife sells for as low as $150, well it really is mind blowing. The fit and finish is outstanding, blowing something like the Paramilitary 2 out of the water. The fact that this knife is manufactured in the USA, is so well made, and features such a thoughtful design make it an instant classic in my book. Highly recommended. I recommend purchasing the Hogue EX04 at Amazon or BladeHQ. Purchasing anything through any of the links on this website helps support BladeReviews, and keeps the site going. As always, any and all support is greatly appreciated – thank you very much! Hey Judas, thanks for stopping by! You know for some reason it took me a while to check this one out too. I’m glad I did though, it’s a really nice knife. I think I’ll be much faster to pull the trigger on the EX04 than I was on the EX01. 🙂 Anyhow, if you do decide to get it let me know what you think. Thanks again. Thanks for the great advice, Sam! I have been meaning to get a Sypderco UF stone for some time. I’ve actually tried the dishsoap trick with some of my diamond stones but never on ceramics – I’ll have to give that a go. I’d love to try and preserve the pretty edge on this EX01, thanks again for the excellent suggestion. 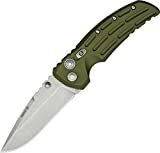 Just wanted to let everyone interested in this knife around here know that there’s a guy selling two NIB for 20 bucks today (11/08/12). It’s too big for me but talk about a hell of a deal- I just bought a brown Delica 4 from him for 30 bucks. Went back to find the link to post and they were already gone. Someone got lucky! Just ran across your website and I really enjoyed your review of the EX01! This knife is definitely on my radar. Love the work Alan did on it and look forward to more Hogue offerings. Keep up the great work, it is much appreciated. Thank you, Nick! The EX01 is an awesome knife. Hogue really is onto something with this collaboration with Allen and I am pleased to say that I will be doing a review of the EX04 very soon. Thanks again for reading and taking the time out to leave a comment. Thanks Dan, this review made me get the 3.5″ EX-01 green aluminum drop point. As you well know, choosing among the various hogue options is no small feat ;). I am loving it, the action, build quality and finish made me feel like I got a real steal/custom knife. Not to mention, they took the time to sharpen and POLISH the blade edge to perfection. The other knives I am going to get after going through your website are CS American Lawman and Buck Marksman. You do a great job, great pics and well written reviews. Looking forward to more… Big thumbs up! Awesome! Glad you are enjoying your EX01 – what an excellent knife. I have the EX04 now and I love it. The Lawman and Marksman are both solid buys. I enjoy em and think if you like the EX01 you will likely appreciate the Lawman and Marksman as well, as they are both well made and great performers. Thanks again for dropping by. I’ve owned one for about four months now. I took it out on a short hike with my family during which I planned to make a small camp fire and grill some sausages. I started to prepare the firewood from sticks and dead bits of thicker wood and that required a bit of light batoning of the back of the blade. -I repeat: light batoning. After a couple of taps on the back of the knife, the locking mechanism not only gave up but completely broke up, rendering the 200$ knife totally useless. Needless to say, I’m very disappointed by the knife and I’m very interested what Hogue has to say about the matter.